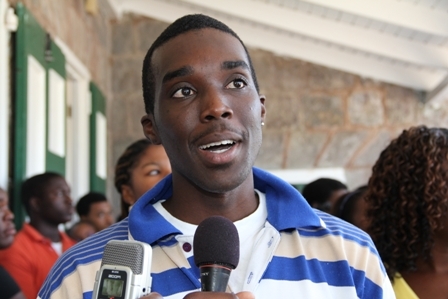 NIA-CHARLESTOWN NEVIS (April 21, 2011) — Students from the Nevis Sixth Form were not lost in their show of gratitude for the sitting Nevis Island Administration (NIA) on Thursday morning at Bath Hotel, when the entire 137 strong student population were presented with brand new state of the art Hewlett Packard laptops. 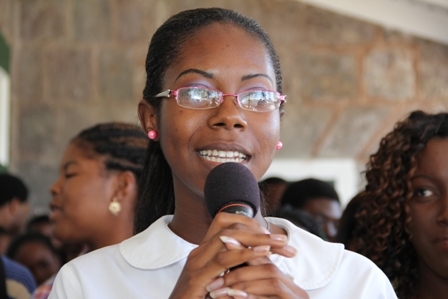 The first student was Ms. Danika Browne of Jessups Village was the first student to express her profound gratitude. “I feel very pleased about the computers and I would like to thank the present Government and everybody who contributed to our laptops this morning. Thank you,” she said. “I am very excited by the work done by the NRP Government in producing these laptop computers for us this morning,” he said, while Mr. Robert Morton of Prospect noted that he felt “great” about “receiving my” computer. 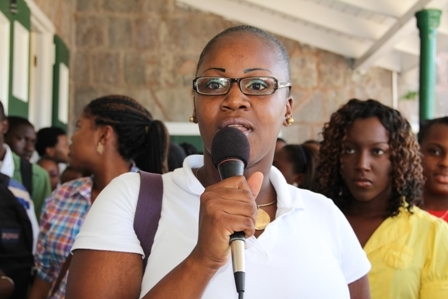 Ms. Denicia Smithen of the St. Thomas Parish also expressed her sentiments. 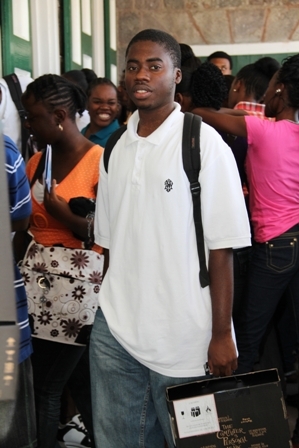 “I would like to thank the NRP Government for giving us our laptops and [also] the Fifth Formers. Performance really matters! Thank you,” she said. 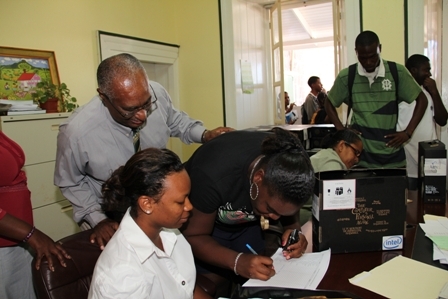 Moments earlier to a brief address dotted with bursts of applause from the students, Premier of Nevis and Minister of Education Hon Joseph Parry accompanied by Principal Education Officer in the Ministry of Education on Nevis Mrs. Lornette Queeley-Connor and other Cabinet members, urged the students to see the personal computers as a tool that would propel them forward. “This morning is not just a symbol but it is a presentation in terms of opening the doors of the future for you and for others who will follow. Each of you will get a computer, remember it is yours to care for, it is yours to help you move forward in this world,” he said. 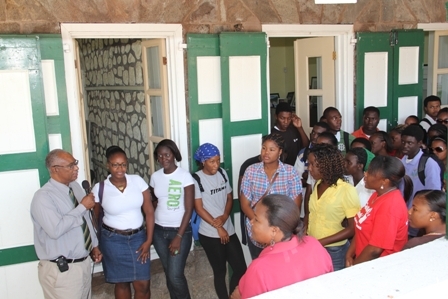 Mr. Parry also told the students of his hope that they would be the start of a new direction in Nevis and admonished them to not live by the “crab in a barrel” mentality which in his view was a disgraceful thinking of black people but instead he said they should move forward and uplift each other instead of pulling each other down. “I want you to be proud of yourselves. I want each of you to be proud of what you can do and I want you to say we are 137 persons and all of us will go to college, all of us will go to university and all of us will make a difference in this country,” he said. In conclusion, the Premier congratulated the students on receipt of the computers and wished them well in their future endeavours. 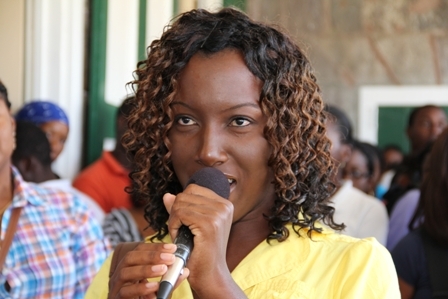 “I want to congratulate each and every one of you for receiving the computer. I want each and every one of you to do well. You don’t have to do as great as anybody else, once you do your best that is good enough. “Every one of you I want to pass [overseas examinations] and every one of you I want to make a difference in this country and you know what? In 10 years some of you should either in Parliament or heading there, we need to get rid of the nonsense that goes for leadership in this country. Good morning and I thank you,” he said.